Apple and Samsung have both reported their financials for Q2 2013 so, as is customary, analyst firms are now putting out their estimates for the quarter. IDC is out of the blocks, noting that Samsung and Apple remain the market leaders but greater growth is coming from lesser companies. The research firm estimates that Samsung — which hasn’t provided figures publicly since Q3 2011 — shipped 72.4 million smartphones during the quarter. That number is 44 percent higher than the estimate one year previous, but IDC says Samsung’s share of the market has receded slightly, going from 32.2 percent last year to 30.4 percent in Q2 2013. Looking at things quarter-by-quarter, the Galaxy S4 launch pushed Samsung’s sales total up by 1.7 million units over its Q1 2013 figure. Its share of market is also down 2.4 percent on the previous quarter. Apple’s 31.2 million shipments (which were actually sales) represent a 13.1 percent share of the market, which is down on 16.6 percent in Q2 2012 even though its shipments grew by 20 percent over the 12-month period. The US firm saw market share drop from 17.3 percent in the previous quarter. Indeed, LG, Lenovo and ZTE — which round out the top five — each enjoyed greater year-on-year and quarterly growth than either Apple or Samsung. LG’s record haul of 12.1 million smartphone shipments represented a 130 percent year-on-year improvement, which IDC estimates to have grown its market share from 3.1 percent to 4.7 percent. Lenovo is back in the top five after a six month absence. The Chinese firm charted 130.6 percent year-on-year shipment growth, the highest of any top-5 vendor, after shipping 11.3 million devices for an estimated 4.7 percent market share. Fellow Chinese phone-maker ZTE saw its shipments jump 57.8 percent to 10.1 million units, or 4.2 percent market share, according to IDC. 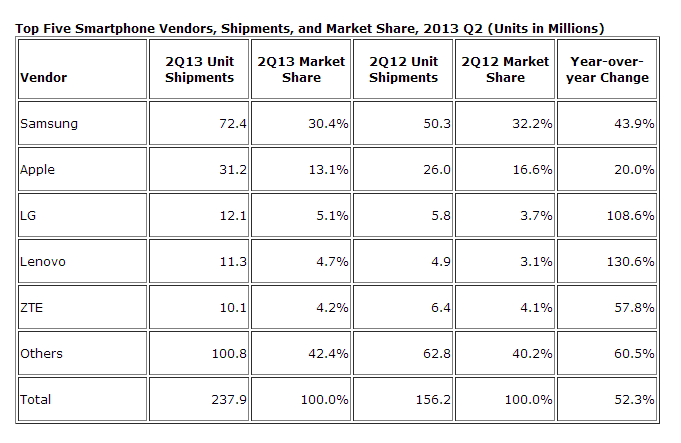 Nokia, RIM, HTC, Sony and the rest of the competition are bundled into ‘others’, a category that accounts for 42 percent of IDC’s Q2 2013 shipment estimates. We know that sales of the discounted iPhone 4 help boost Apple’s figures for the quarter, and IDC says that Samsung enjoyed a similar boost from the Galaxy S3, which received price cuts following the launch of the Galaxy S4. While Samsung remains out in front, the progress of LG is promising for the Android ecosystem. IDC credits Korea’s LG for “realiz[ing] a profit from its steady diet of Android-powered smartphones,” and it is certainly a different story to HTC which — though still posting slim profit — has seen its figures decline significantly over the past year or so. IDC Research Manager Ramon Llamas says the data is proof that “the competition refuses to be shut out altogether” despite Apple and Samsung’s dominance. IDC says that LG, Lenovo and co are performing well with high-end devices, as well as lower-priced offerings, but it will be interesting to see how they perform as and when Apple launches a much-anticipated new iPhone model, which is expected in the coming months — particularly if older iPhones are discounted. We crunched IDC’s numbers since Q3 2011 to come up with this chart. Unfortunately it appears that the company regularly updates its figures without noting the changes, so the estimates for Q2 2012 are different to the comparative figures that were published today. Equally data is only released on the top 5 firms each month, but we think it is an interesting visual resource all the same.